Corona Contracts are specialists in the design, manufacture and installation of theatre, acoustic and stage curtains. We have a huge range of fabrics available to suit all requirements and an experienced installation team who will install your stage backdrop curtains with a perfect finish. At Corona Contracts, we aim to deliver a professional fit and finish with every project we undertake. Our bespoke stage backdrop curtains offer unbeatable value and are manufactured to the highest standards to ensure trouble free commercial operation for years to come. One of the main advantages of working with Corona Contracts is that we control every stage of the manufacturing and installation process from start to finish. All of our stage backdrop curtains are designed on site at our headquarters in Preston by the same team who then puts them together. Over the years we have become very skilled at working closely with our clients to deliver their vision. When we have finished designing and creating your stage curtains we will arrange a suitable date for installation. We’ve worked in many different environments and fully appreciate the need for contract and building maintenance work to be completed without disruption to the day to day operation of the venue in which it is being carried out. To this end, we will work with you to find the most suitable time to carry out the installation. The fact that we take care of the installation ourselves means you can be sure that you will receive a truly outstanding fit and finish. As we design and create the stage curtains ourselves, we know exactly what fitment strategy will achieve the most reliable and lasting results. We have plenty of experience working in older buildings with unusual designs or challenging access requirements, so rest assured that no matter how unique your situation is, we have the skill and experience to get great results in even the most challenging environments. Theatre curtains used in public spaces should adhere to all health and safety regulations. Having designed and installed curtain systems for a number of years in public places including NHS hospitals, we are fully versed in all the relevant legislation and our employees will endeavour to carry out their work while maintaining safety at all times. Stage backdrop curtains for drama classrooms and school halls can be installed with anti-ligature systems as well as BS5867 complaint fireproofing material. 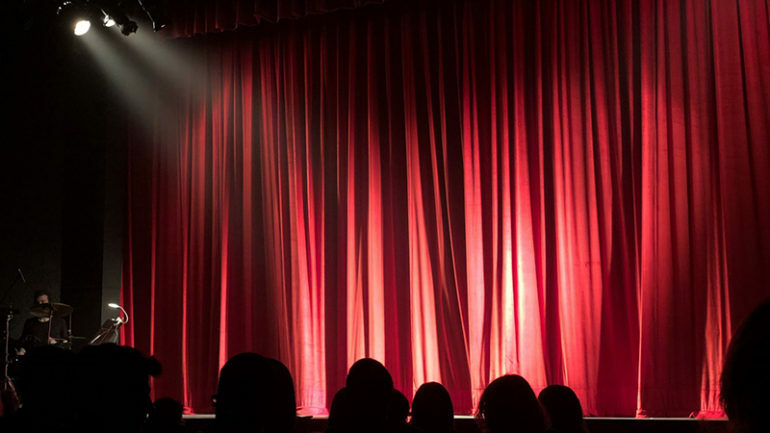 When our engineers install theatre curtains, risk assessments will be taken where needed and signage will be used to indicate that work is taking place. Once work is completed our engineers will clean up fully and remove all tools and debris from the area, leaving it completely safe for use. Our top quality curtain tracking systems are sourced from Mottura. Combining function with aesthetics, this system can be operated manually or remotely with the “M2Net” system, which is a range of products and software developed by Mottura for Automation Control which can be operated from a PC, tablet or smartphone. In the event of power outage, the electronic systems can also be operated manually. All tracks can be curved to suit specific circumstances and installations and all systems have a soft start and soft stop feature. Mottura products are manufactured using the highest quality components, ball bearing runners and steel brackets. Curtains weighing up to 150 kg or an overall track length of 30m can be achieved, so size is never a problem. If you have any further questions about our services or want to book an installation please don’t hesitate to reach out to us at Corona Contacts today.